The interaction of wine and phenolics from cork stoppers produces a newly-identified set of compounds that affect a wine’s colour and bitterness – and these are called Corklins. As the drinks business was first to report back in 2015, phenolic compounds that are naturally present in cork stoppers will migrate into wine in a linear fashion over time to form new compounds, and such compounds have been shown to reduce colour deterioration and astringency in wine. Significantly, in a new development, they have been given the name Corklins, following a paper published in the Journal of Agricultural and Food Chemistry in September 2017. Drawing db’s attention to the new name and the creation of these compounds was Amorim’s director of R&D, Dr. Miguel Cabral, during a discussion in Portugal on Tuesday this week. Continuing, he stressed that such compounds, which include tannins, phenols and polyphenols, are the same as those found in oak barrels – cork is, after all, the bark of the cork oak (Quercus suber). The passage of these compounds is of course far less significant from a cork stopper than an oak barrel, and Cabral told db that, over 35 months, a wine sealed with cork would contain less than one tenth of these extractable compounds compared with a wine in a barrel – although this will be even lower with agglomerated corks. Nevertheless, it has been shown that, even at low levels, the phenols from the cork stopper will react with catechins and malvidins in the wine to form new and bigger compounds that will affect the colour and astringency of the wine over time, according to Cabral, and it is these larger tannin-derived compounds that have been called Corklins. He also said that the humidity in the headspace of the bottle, at almost 100%, was high enough for phenolics to migrate from the cork stopper into the wine when the bottle was stored upright. Furthermore, as previously noted by db, Cabral has observed different levels of extractable phenolics in cork, and is now working on a “big research project” with the University of Portugal to find out the capacity of different stoppers to release phenols. Commenting that they are using Near Infrared Spectrometry to classify the cork stoppers from low to high, he said that a cooper such as Radoux is employing the same technology to grade oak staves according to the phenolics, specifically tannins, that will be released into the wine. 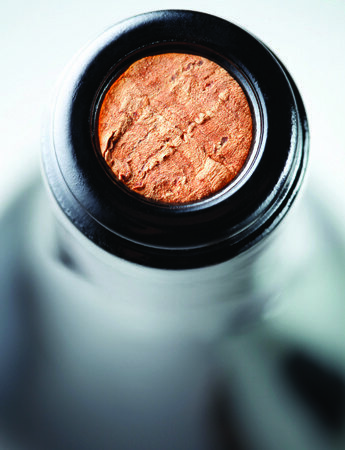 As also previously reported by db, a natural cork stopper will release tiny amounts of oxygen into the wine in the first 6-8 months after it is inserted into the bottle, and this comes from within the cells of the cork as it is compressed. He added, “The network inside a cork is complicated, with millions of cells, so the air escapes slowly and then less and less.” He also recorded that there is more oxygen in natural cork than micro-agglomerated cork, because the latter has glue in it, and it is therefore more dense, so less oxygen is released. Significantly, the oxygen that is released during the first 6-8 months of a wine’s life in a bottle may influence the development of the wine several years later, said Cabral. Indeed, it may facilitate oxidative reactions, which mean that a wine sealed with a cork stopper is less likely to develop in a reductive way, while the transfer of phenolic compounds may also positively influence the ageing process. Of course such elements are mostly relevant to fine wines, but such discoveries are starting to help explain why many winemakers believe that a high-grade natural cork stopper is the best way to seal a wine destined to age and develop over several years in the bottle. For cork selection purposes we used to fill a quart jar with corks and cover the corks with as neutral wine as we could find and hold for tasting the next day. Most of the cork samples improved the taste of the wine. One lot had delicious oak flavors and the joke was that we needed those oak barrels for aging. Corks also absorb volatile compounds other than water and ethanol vapour from the wine and in doing so, they modify the taste of the wine. If a cork which has been in the bottle for several or more years is rinsed and then sealed in a small jar with a few mls of odour-free water for 1-2 days, it will emit a range of odorous compounds.